Produced and distributed by Paramount Pictures, the film is notable for being the first to be released in VistaVision, a widescreen process developed by Paramount that entailed using twice the surface area of standard 35mm film; this large-area negative was used to yield finer-grained standard-sized 35mm prints. On Christmas Eve, 1944, somewhere in Europe, two World War II U.S. Army soldiers, one a Broadway entertainer, Captain Bob Wallace (Bing Crosby), the other an aspiring entertainer, Private First Class Phil Davis (Danny Kaye), perform for the 151st Division ("White Christmas"). But, word has come down that their beloved commanding officer, Major General Thomas F. Waverly (Dean Jagger), is being relieved of his command. He arrives for the end of the show and delivers an emotional farewell. The men give him a rousing send-off ("The Old Man"). At the end of the performance, everyone is forced to take cover from an aerial bombing run. One bomb knocks over a partially-destroyed building, but Bob is too busy shouting orders to notice. Phil throws him out of the way and his arm is injured by debris. Bob later visits Phil at a field hospital and thanks the private for saving his life. When Bob offers a favor to repay the debt, Phil shows him a duet he wrote and asks to perform with Bob back in New York City. Feeling obligated by Phil's heroism, Bob agrees. After the war, Bob and Phil make it big in nightclubs, radio, and then on Broadway, eventually becoming successful producers ("Hi Hup", "Heat Wave", "Blue Skies"). They mount their newest hit musical titled Playing Around. The same day they receive a letter from "Freckle-Faced Haynes, the dog-faced boy," their mess sergeant from the war, asking them to look at an act that his two sisters are doing. When they go to the club to watch the act ("Sisters"), Phil notices that Bob is smitten with Betty (Rosemary Clooney). Phil has eyes for her sister, Judy (Vera-Ellen). Betty and Judy join Bob and Phil at their table, and Phil dances with Judy, so that Bob and Betty can get to know each other. Phil and Judy hit it off ("The Best Things Happen While You're Dancing"). Bob and Betty do not, getting into a minor argument about how Bob thinks that everyone has an angle in show business. Judy and Betty are headed for the Columbia Inn in Pine Tree, Vermont, where they are booked to perform over the holidays. Due to a disagreement with their landlord (he claimed that they had burned an expensive rug at his hotel and had even summoned the sheriff to arrest them), the girls have to leave immediately, so Phil gives the sisters his and Bob's sleeping-room accommodations aboard the train and delays the sheriff by imitating the girls' signature number ("Sisters" redux). Bob and Phil board later and Bob is extremely upset that they have to stay up all night in the club car on their way to NYC. They are joined by Betty and Judy, who thank them profusely for the tickets and convince them to come with them to Pine Tree ("Snow"). When the train arrives in Pine Tree, there's not a snowflake in sight, and chances of it falling appear dim. Bob and Phil discover that the inn is run by their former commanding officer, General Waverly. Waverly has invested all of his savings into the lodge, which is in danger of failing because there's no snow and thus no guests. To bring business to the inn, Bob and Phil bring the entire cast and crew of their musical Playing Around, and add in Betty and Judy to the rehearsals ("Minstrel Number"). Bob and Betty's relationship blooms ("Count Your Blessings") and they spend a good deal of time together. Meanwhile, Bob discovers the General's request to rejoin the army has been rejected. He decides to prove to the General that he isn't forgotten. While rehearsals continue ("Choreography") Bob calls Ed Harrison (Johnny Grant), an old army buddy, now a successful variety show host, to arrange a televised invitation to all the men formerly under the command of the General to come to the inn on Christmas Eve as a surprise. In response, Harrison suggests they go all out and put the show on national television to generate free advertising for Wallace and Davis, but Bob insists that it will have nothing to do with their business. Unbeknownst to Bob, nosy housekeeper Emma Allen (Mary Wickes) has been eavesdropping, but she has only heard the part about free advertising, not Bob's rejection of the idea. Mistakenly believing that her beloved boss will be portrayed as a pitiable figure in a nationwide broadcast, Emma reveals what she has heard to a shocked Betty. The misunderstanding causes Betty to grow suddenly cold towards a baffled Bob. While this is happening, Judy becomes convinced that Betty will never take on a serious relationship until Judy is engaged or married. She pressures a reluctant Phil to announce a phony engagement, but the plan backfires when Betty abruptly departs for New York City to take a job offer since Judy is taken care of. After rehearsals are complete ("Abraham Number"), Phil and Judy reveal to Bob that the engagement was phony. Bob, still unaware of the real reason behind Betty's coldness, goes to New York for The Ed Harrison Show, but decides to stop and try to convince Betty to come back. Bob sees Betty's new act ("Love, You Didn't Do Right by Me") and reveals the truth about the engagement, and Betty starts to warm up to him, but he is called away by Ed Harrison before learning what is really bothering her. Back at the Inn, Phil fakes an injury to distract the General so he won't see the broadcast of Bob's announcement. On the broadcast, Bob invites veterans of the 151st Division to come to Pine Tree, Vermont, on Christmas Eve ("What Can You Do with a General"). Betty catches Bob's televised pitch and realizes she was mistaken. She returns to Pine Tree in time for the Christmas Eve show, but only tells Judy. The whole division comes into Pine Tree secretly. When the General enters the lodge, he is greeted by his former division, who sing a rousing chorus of "The Old Man." Just as the following number ("Gee, I Wish I Was Back in the Army") ends, he learns that snow is finally falling. In the finale, Bob and Betty declare their love for one another, as do Phil and Judy. The background of the set is removed to show the snow falling, and Bob, Betty, Phil and Judy perform "white Christmas" while everyone raises a glass, and toasts, "May your days be merry and bright; and may all your Christmases be white." All songs were written by Irving Berlin. The centerpiece of the film is the title song, first used in Holiday Inn, which won that film an Oscar for Best Original Song in 1942. In addition, "Count Your Blessings" earned the picture its own Oscar nomination in the same category. Free – the only thing worth fighting for is to be free. Free – a different world you'd see if it were left to me. A composer's demo of the original song can be found on the CD Irving Sings Berlin. The song "What Can You Do with a General?" was originally written for an un-produced project called Stars on My Shoulders. Trudy Stevens provided the singing voice for Vera-Ellen, except for "Sisters", where Rosemary Clooney sang both parts. It was not possible to issue an "original soundtrack album" of the film, because Decca Records controlled the soundtrack rights, but Clooney was under exclusive contract with Columbia Records. Consequently, each company issued a separate "soundtrack recording": Decca issuing Selections from Irving Berlin's White Christmas, while Columbia issued Irving Berlin's White Christmas. On the former, the song "Sisters" (as well as all of Clooney's vocal parts) was recorded by Peggy Lee, while on the latter, the song was sung by Rosemary Clooney and her own sister, Betty. Berlin wrote "A Singer, A Dancer" for Crosby and his planned co-star Fred Astaire but when he was unavailable, Berlin re-wrote it as "A Crooner – A Comic" for Crosby and Donald O'Connor, but when O'Connor left the project so did the song. Another song written by Berlin for the film was "Sittin' in the Sun (Countin' My Money)" but because of delays in production Berlin decided to publish it independently. 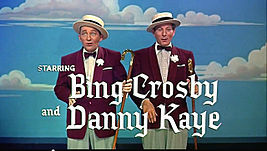 Crosby and Kaye also recorded another Berlin song ("Santa Claus") for the opening WWII Christmas Eve show scene, but it was not used in the final film. Their recording of the song survives, however, and can be found on the Bear Family Records 7-CD set called Come On-A My House. White Christmas was intended to reunite Crosby and Fred Astaire for their third Irving Berlin showcase musical. Crosby and Astaire had previously co-starred in Holiday Inn (1942) – where the song "White Christmas" first appeared – and Blue Skies (1946). Astaire declined the project after reading the script and asked to be released from his contract with Paramount. Crosby also left the project shortly thereafter, to spend more time with his sons after the death of his wife, Dixie Lee. Near the end of January 1953, Crosby returned to the project, and Donald O'Connor was signed to replace Astaire. 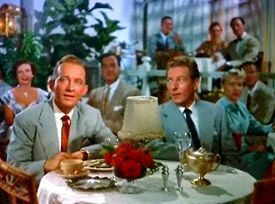 Just before shooting was to begin, O'Connor had to drop out due to illness and was replaced by Danny Kaye, who asked for and received a salary of $200,000 and 10% of the gross. Financially, the film was a partnership between Crosby and Irving Berlin, who shared half the profits, and Paramount, which got the other half. Within the film, a number of soon-to-be famous performers appear. Dancer Barrie Chase appears un-billed, as the character Doris Lenz ("Mutual, I'm sure!"). Future Academy Award winner George Chakiris also appears as one of the stone-faced black-clad dancers surrounding Rosemary Clooney in "Love, You Didn't Do Right by Me". 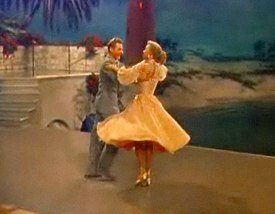 John Brascia leads the dance troupe and appears opposite Vera-Ellen throughout much of the movie, particularly in the "Mandy" and "Choreography" numbers. The photo Vera-Ellen shows of her brother Benny (the one Phil refers to as "Freckle-faced Haynes, the dog-faced boy") is actually a photo of Carl Switzer, who played Alfalfa in The Little Rascals, in an army field jacket and helmet liner. A scene from the film featuring Crosby and Kaye was broadcast the year after the film's release, on Christmas Day 1955, in the final episode of the NBC TV show Colgate Comedy Hour (1950–1955). Principal photography took place between September and December 1953. The film was the first to be shot using Paramount's new VistaVision process, with color by Technicolor, and was one of the first to feature the Perspecta directional sound system at limited engagements. Bosley Crowther of The New York Times was not impressed: "...the use of VistaVision, which is another process of projecting on a wide, flat screen, has made it possible to endow White Christmas with a fine pictorial quality. The colors on the big screen are rich and luminous, the images are clear and sharp, and rapid movements are got without blurring—or very little—such as sometimes is seen on other large screens. Director Michael Curtiz has made his picture look good. It is too bad that it doesn't hit the eardrums and the funnybone with equal force." 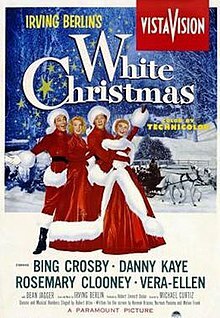 Variety liked it: "White Christmas should be a natural at the boxoffice, introducing as it does Paramount's new VistaVision system with such a hot combination as Bing Crosby, Danny Kaye and an Irving Berlin score...Crosby and Kaye, along with VV, keep the entertainment going in this fancifully staged Robert Emmett Dolan production, clicking so well the teaming should call for a repeat...Certainly he (Crosby) has never had a more facile partner than Kaye against whom to bounce his misleading nonchalance." White Christmas was enormously popular with audiences, earning $12 million in theatrical rentals – $102.7 million in 2012 dollars, adjusted for inflation – making it the top moneymaker of 1954 by a wide margin. The second highest moneymaker of that year, The Caine Mutiny, earned $8.7 million. Overall, the film grossed $30 million at the domestic box office. There was a US theatrical re-release by Paramount in 1961. White Christmas was released on US VHS in 1986 and again in 1997. The first US DVD release was in 2000. It was subsequently re-released in 2009, with a commensurate Blu-ray in 2010. The most recent US issue was a 4-disc "Diamond Anniversary Edition" in 2014. This collection contains a Blu-ray with extras, two DVDs with the film and extras, and a fourth disc of Christmas songs on CD. These songs are performed individually by Crosby, Clooney, and Kaye. A stage adaptation of the musical, titled Irving Berlin's White Christmas premiered in San Francisco in 2004 and has played in various venues in the US, such as Boston, Buffalo, Los Angeles, Detroit and Louisville. The musical played a limited engagement on Broadway at the Marquis Theatre, from November 14, 2008 until January 4, 2009. The musical also toured the United Kingdom in 2006 - 2008. It headed to the Sunderland Empire in Sunderland from November 2010 to January 2011 after a successful earlier run in Manchester and has continued in various cities with a London West End run at the end of 2014. ^ "WHITE CHRISTMAS (U)". British Board of Film Classification. September 13, 1954. Retrieved December 4, 2014. ^ "The VistaVision Story". www.widescreenmuseum.com. Retrieved 2016-05-07. ^ "Discogs". Discogs.com. Retrieved January 26, 2016. ^ Reynolds, Fred (1986). Road to Hollywood. Gateshead, UK: John Joyce. p. 231. ^ "Barnes & Noble". Barnes & Noble. Retrieved January 26, 2016. ^ a b c d "White Christmas (1954) - Notes - TCM.com". Turner Classic Movies. ^ "Biography for George Chakiris". Turner Classic Movies. ^ Crowther, Bosley. "The New York Times". The New York Times. Retrieved January 26, 2016. ^ "Variety". September 1, 1954. ^ "The Top Box-Office Hits of 1954", Variety Weekly, January 5, 1955. ^ Steinberg, Cobbett (1980). Film Facts. New York: Facts on File, Inc. p. 22. ISBN 0-87196-313-2. Wikimedia Commons has media related to White Christmas (film).